I had a tough time deciding which Mexican hot chocolate to review first. There are a ton of them! I wanted to review a very authentic one first, but I also wanted to introduce them the way I was introduced to them. 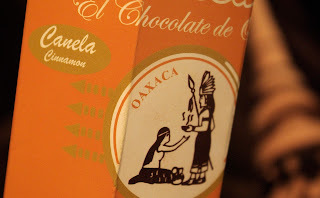 It turns out, the first one I ever had was a pretty darn authentic one, La Soledad Canela flavored hot chocolate. 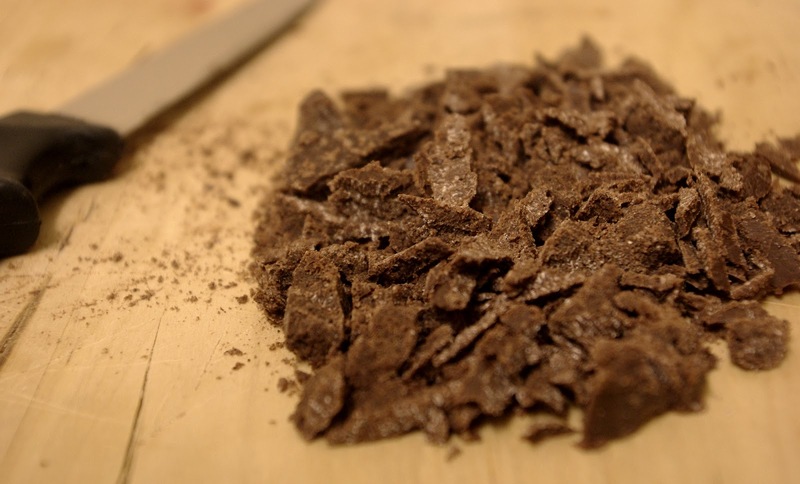 Unlike most American packaged hot chocolates, this isn't a powder mix, it's a solid chocolate tablet. That's how most traditional Mexican hot chocolates comes, as a tablet. Another staple of Mexican hot chocolates is cinnamon. They almost all seem to have it, which certainly isn't a bad thing. And a few of them often have nutty flavors, as well. La Soledad makes quite a few other varieties of hot chocolate, but what I have here is the canela (Spanish for cinnamon). They're a Mexican company, located in Oaxaca (wa-HOCK-a), Mexico. Oaxaca is known for cacao, used in mole sauces and as a beverage. So, yeah, this is good, authentic stuff. My girlfriend discovered this hot chocolate while doing a project with some Mexican and Aztec influences. She wanted to serve Mexican hot chocolate at the presentation, and found a place in Eagle Rock, CA, called Cacao Mexicatessan that sold this. Not only do they serve amazing food there, but they sell all kinds of imported products from Mexico, mostly cacao things. 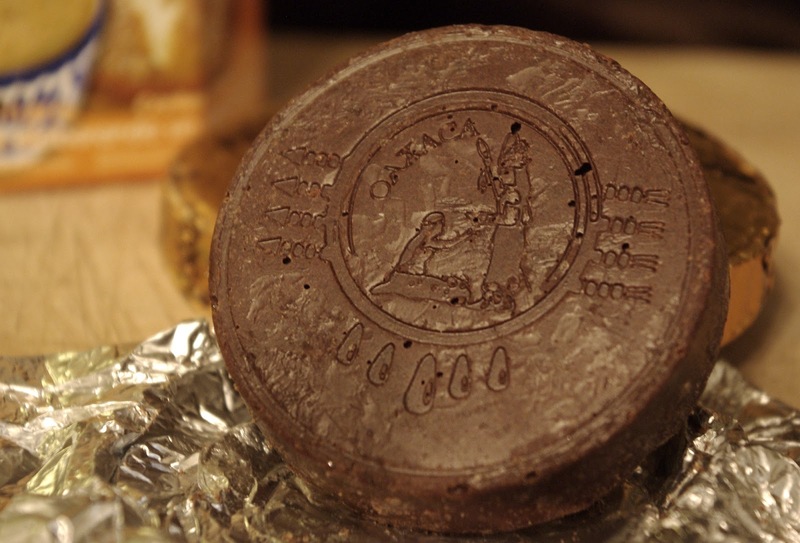 The chocolate tablets are molded with La Soledad's logo and individually foil wrapped. As usual, when I have a big chunk of chocolate to melt into some milk or water, I chop it up pretty thoroughly. Most Mexican chocolate tablets have a coarse, grainy texture. You may find that it doesn't melt completely, leaving grains at the bottom of the cup. That could be cinnamon, or perhaps it's the stone ground cacao. Whatever it is, it's fine to eat it if you want to. If it's the cacao, it's actually good for you! Let's talk about another thing the Mexicans do with their hot chocolate - frothing! 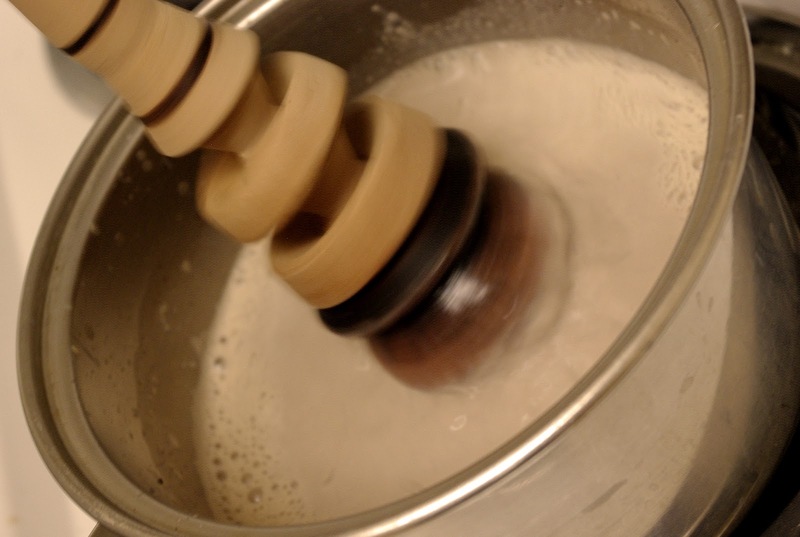 Frothing is whipping the chocolate until a foam covers the surface. Before the Spanish reached Mexico in the 16th century, hot chocolate drinks were frothed by pouring them from one pitcher to another over and over. 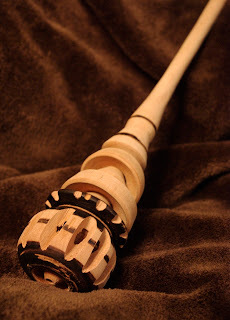 The Spaniards then invented the wooden tool pictured here, the molinillo. You hold the top of it between your palms and spin it back and forth, and it whips the liquid up into a perfect, yummy froth. I have another frother, an electric one with its own pitcher, and I'll highlight that in a future blog post. For now, I wanted to keep it traditional and do it the old fashioned way. La Soledad Canela hot chocolate is nice and light, a perfect breakfast or afternoon hot chocolate. 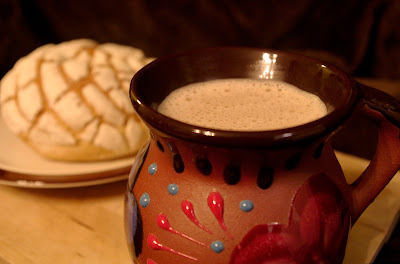 In Mexico, hot chocolate is traditionally served with pan dulce, which are sweet breads that come in many varieties. I even found a great handmade and painted Mexican mug! 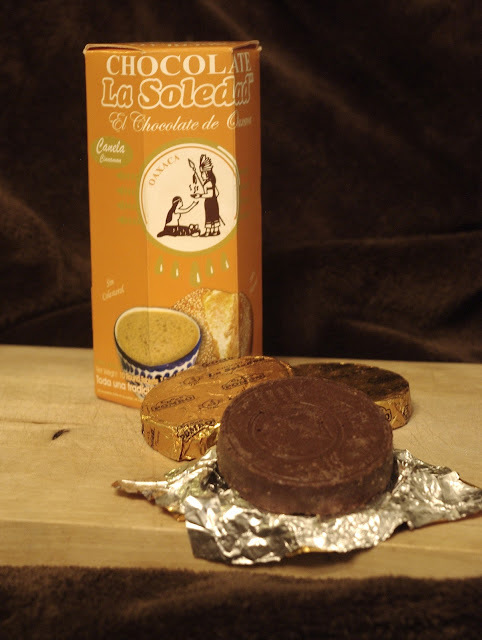 I couldn't find La Soledad on Amazon, so as far as I know, the only way to get it is to swing by Cacao Mexicatessan and pick some up, or to order it from their website, which requires that you email them about the products you want. 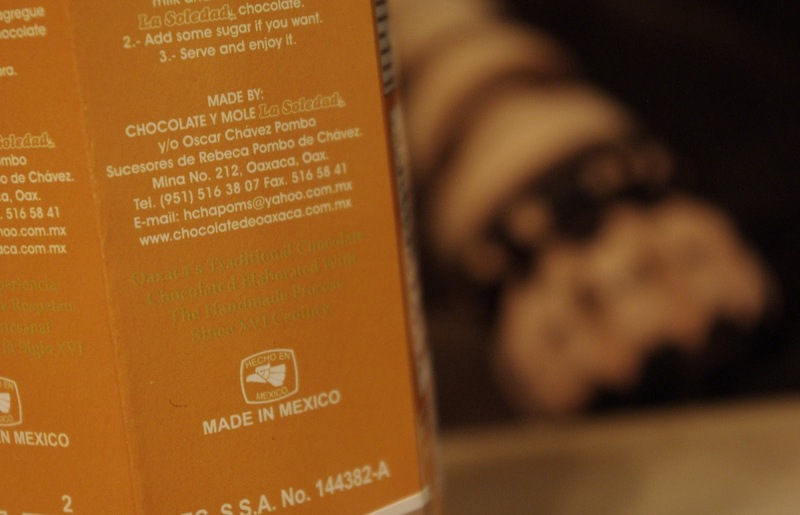 Do you know of any Mexican hot chocolates? Which is your favorite? I have an entire cupboard full, and I'll get to reviewing them all eventually, but please comment below and let me know your favorites. Or even better, a recipe!